I have always loved the tart taste of rhubarb, and it's an easy perennial plant to grow in most areas. It is wonderful in desserts, and pairs nicely with many other fruits. Strawberries and rhubarb are a classic flavor combination. Here are some of my favorite rhubarb recipes, including an excellent pie, delicious cobbler, and more. This wonderful crumb cake is a great way to use the spring rhubarb and strawberries. 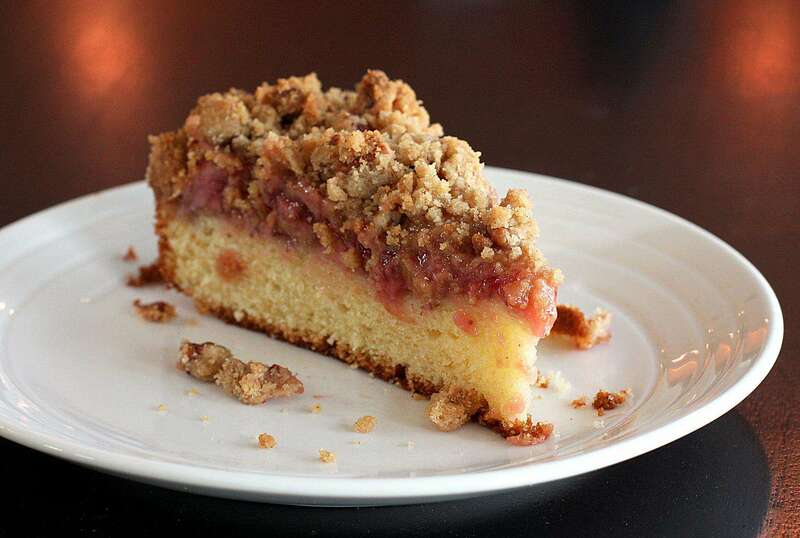 Serve this delicious rhubarb crumb cake as a coffee cake or as a dessert. If you're watching calories and fat, try this dessert with low-fat whipped topping or vanilla yogurt in place of the whipped cream. A simple rhubarb compote makes a fabulous topping for ice cream or pound cake, or spoon some over your pancakes, biscuits, or waffles in the morning. This flavorful rhubarb cobbler is quick and easy to prepare with biscuit mix. Feel free to use frozen rhubarb in this recipe or add some fresh sliced strawberries to make a strawberry-rhubarb cobbler. The buttery spiced crumb topping makes this rhubarb crumble pie extra-special. Serve this awesome pie with a scoop of ice cream for a perfect summer dessert. This is a super easy cake to make with fresh rhubarb, a cake mix, and strawberry gelatin. This dessert recipe is a great way to celebrate rhubarb, and it makes a welcome treat for the family. Serve the dessert cold or warm, plain or with a little cream or a scoop of ice cream. This version of a rhubarb crisp is made with a cinnamon spiced oat and brown sugar topping. The rhubarb is briefly cooked with a little water and cornstarch, along with sugar and vanilla extract. This rhubarb jam is prepared with orange and lemon, for a citrus marmalade flavor. Save your surplus rhubarb with this easy jam. Bake this fabulous rhubarb crisp for your family. The crisp is topped with a buttery, crunchy oat topping. Serve this dessert with a dollop of whipped cream or scoop of ice cream. This rhubarb sauce is super easy to make with fresh sliced rhubarb, and it makes a great topping for pancakes, waffles, ice cream, and other desserts. Use a homemade crust or easy refrigerated crust for this classic strawberry rhubarb pie. this is the perfect spring and summer dessert. How Do You Make Mint Jelly Sauce?